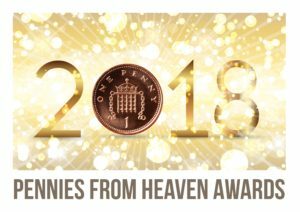 We are very pleased to announce the Pennies from Heaven 2018 Award winners. Once again we have been overwhelmed with the number of entries and are excited to be giving out more Awards than ever before. The Pennies from Heaven Awards are given every year to celebrate fundraising excellence and is our way of endorsing organisations that not only support charitable giving in the workplace but do so exceptionally well. This year we are giving out 35 Pennies from Heaven Awards which is the most in six years of running the Awards. We are pleased to say that six employers received a Platinum Award with over 40% of staff/pensioners participating and Liverpool Women’s NHS Foundation Trust topped the table with an amazing 83% of staff taking part. The benchmarks to reach to gain a Pennies from Heaven Award remain high with Bronze starting at 10% and the Platinum Award, at 40%+ participation, is the highest of any Fundraising recognition scheme. Michelle Turner MCIPD – Director of Workforce & Marketing. Liverpool Women’s NHS Foundation Trust. In 2017 many new employers launched Pennies from Heaven and we are delighted to see three of them already receiving Awards. The Phoenix Group and HSS Hire have both received a Gold Award and Amcor Plastics have received a well-deserved Bronze Award. Kimberley Sanger, Reward, Human Resources. HSS Hire. Our University members have also made great gains in the past year following strong promotions. Cardiff Metropolitan University have received a Gold Award a step change from the Bronze Award they achieved in 2017 and the University of Essex have taken their first Silver Award. We are also presenting a Special Recognition Award to Manchester University NHS Foundation Trust whom have worked incredibly hard to raise the profile of the scheme amongst their staff. Donations have more than doubled in the last twelve months and we very much hope to see this continue in 2018. Kate Frost. CEO. Pennies from Heaven . *Participation calculated using the three month donation average on last three donation payments paid to charities in 2017. If less than three payments received then average calculated from those. It is assumed a 50p average donation per month per employee. Entry into Awards only where employers provide Pennies from Heaven with staff numbers.